This report should be cited as: Coloma – Lotus Fire Safe Council. November 2016. Community Wildfire Protection Plan for the Coloma – Lotus Fire Safe Council Area of El Dorado County, California. Prepared for the El Dorado County Fire Safe Council, Diamond Springs, California. Provide a ready list of area-specific projects. The CLFSC area, shown in a map attached to this document, encompasses approximately 20 square miles (13,000 Acres). The CLFSC boundaries, or Sphere of Recognition, were developed over an approximately 6-month period starting with CLFSC organizational meetings in Spring 2015. During meetings, area topographic maps were shown and discussed with attendees, who marked their property location. Over time, the FSC area was extended beyond the central portions of CL to encompass the much of the valley. The boundaries extended to the top of local ridgelines in recognition that the Coloma-Lotus valley is in the lower elevation of this part of the county, therefore any fires that begin here may potentially spread uphill and up canyon into other populated communities such as Greenwood, Garden Valley, Georgetown, Pilot Hill, Placerville, and Rescue. The Council also included federal (BLM), State (Marshall Gold Discovery State Historic Park), local (schools and parks) as well as agricultural properties including American River Conservancy (ARC) lands (Wakumatsu Colony Farm) and Bacchi Ranch property. As discussed below, in a section titled Fire Safe Activities by other CLFSC Area Agencies and Organizations, we sought to build upon existing vegetation management and fire safe activities through coordination with others, while avoiding duplication of effort. The very scenic Coloma – Lotus valley and its adjacent lands has its historical roots in the Gold Rush of 1849. Cullumah (meaning “Beautiful” as given by the Native Nisenan and Foothill Miwok) lied quietly in a valley inhabited by native Americans when in 1847, James Marshall and a small band of Anglo-American workers hired by James Marshall and John Sutter settled in the valley to construct a sawmill along the heavily forested banks and hills of the South Fork American River. Then, on January 24th of 1848, James Marshall found a few flakes of gold in the tailrace of the nearly completed and operational Sutter’s Mill. Once the word got out of the gold discovery, the population of the Coloma – Lotus Valley exploded into the tens of thousands, seemingly overnight from the influx of persons who arrived from throughout the world seeking their fortunes in the search of gold. Hotels, breweries, stores, saloons, wineries, restaurants and almost every conceivable business were established to serve the needs of the miners. As time passed, the miners spread out to other areas prospecting for fresh, undiscovered gold, yet Coloma and Lotus continued for some time to be the home base for supplies and a place that offered these miners a sense of “civilization”. As more years passed and the gold rush subsided throughout the Mother Lode, the Coloma – Lotus community relied more on its agricultural products and some residual mining as its main economic base. Today, the Coloma – Lotus valley relies heavily on tourism and agriculture to support whitewater rafting on the American River as well as local wineries and farms. Today, in addition to the recreational boating, wineries and farms mentioned above, there are approximately 740 residences within the Coloma – Lotus Fire Safe Council’s (CLFSC) area; a small shopping center; resorts; campgrounds; county, state and federal parks and lands; working cattle ranches; restaurants; stores; a gas station; two schools; two community churches, a community hall, and numerous other places of business. The El Dorado Irrigation District (EID) is the main purveyor of water in addition to private wells. The EID water system stores, treats and distributes metered water. PG&E is the public power utility servicing the area. There is also a limited fire hydrant system. El Dorado County Department of Transportation (DOT) maintains county public roads while CalTrans services State Highway 49 (the main artery) that bisects the area. Coloma-Lotus residents live on land parcels ranging from ¼ to 640 acres and larger in size. There are approximately 740 habitable structures with approximately 2,000 people living in the area year-round. Also within the CLFSC boundary are Bureau of Land Management (BLM Department of the Interior) lands consisting of about 1000 acres. 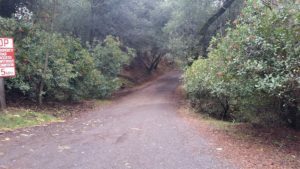 At the core of the Coloma-Lotus valley is the Marshall Gold Discovery State Historic Park that encompasses approximately 576 acres. The most important natural asset in the CLFSC area is the South Fork of the American River which has shaped the Coloma-Lotus Valley. The loss of trees and other plants due to wildfires in the CLFSC area would cause multiple problems as loss of vegetation would reduce a vital part of the functioning ecosystem. Vegetation significantly reduces the amount and speed of storm water runoff, which if left unchecked, pollutes local streams and damages the watershed. Visual impacts from uncontrolled wild land fires, would impact the scenic beauty for which the area is known. Another local asset is the Marshall Gold Discovery State Historic Park. The State Park hosts over 250,000 visitors annually, most which are school children. Its historically significant structures are a recognized and important cultural asset for the State of California and the nation. The Lotus area has the El Dorado County’s highest use County park called Henningsen-Lotus Park. And finally, the American River is the most popular whitewater rafting destination in California. Over a million persons come annually to the Coloma-Lotus area to enjoy the river, camping, concerts, special events, and local nature hikes. Loss of our local wildlife ecosystem would have a major economic loss to local businesses, the County, and California State Parks. The predominant feature of the Coloma-Lotus valley is the South Fork of the American River canyon. The Coloma-Lotus valley as well as the river canyon upstream and downstream of the valley are surrounded by steep canyons with heavy fuel loading. Multiple drainages flow into the South Fork in this area. The main river corridor and these side canyons act as “chimneys” for airflow as the daytime temperatures increase. Airflow is up-canyon in the daytime and then reversed to down-canyon at night. At times when the overall weather systems may be calm, there may be significant breezes up or down these canyons due to this effect. The heavy fuel loading in the area consists of oak and pine forests as well as various brush types and grasses with an understory forming an excessive amount of ladder fuel. The CLFSC area encompasses approximately 20 square miles (13,000 Acres). The South Fork American River’s headwaters and upper watershed lies within the El Dorado National Forest and the Tahoe National Forest. Each of these forests lies on the western slope of the Sierra Mountain Range. With the Coloma-Lotus valley being in the lower elevation of this part of the county, any fires that begin here may potentially spread uphill and up canyon into other populated communities such as Greenwood, Garden Valley, Georgetown, Pilot Hill, Placerville, and Rescue. The SRA Fire Hazard Severity Map shows approximately 50% of the land within the CLFSC area as Moderate; approximately 30% as High; and approximately 20% as Very High. However, a large majority of the most densely populated and developed areas are within the Very High fire hazard category. Bayne Fire (July 1, 2007) – 80 acres along Bayne Road, Mount Murphy area of Coloma. Salmon Fire (August 15, 2012) – 108 acres along Salmon Falls Road, south of Pilot Hill. Camp Lotus Fire (July 6, 2014) – Extent uncertain. Adventure Fire (July 16, 2015) – Over 100 acres along State Highway 49, by the Adventure Connections Campground (west) and Bacchi Ranch (east). Involved El Dorado County Fire, CDCR, El Dorado County Sheriff’s Office, CHP, US Forest Service, Georgetown, Garden Valley, El Dorado Hills, Rescue Fire, and Cameron Park Fire using 21 engines, 4 air tankers, 2 helicopters, 2 dozers and 3 water tenders working through the night. Storkbill Fire (July 22, 2016) – 50 acres off Storksbill Road in Pilot Hill. The El Dorado County Fire Protection District and CALFIRE provide the structural firefighting resources as well as wildfire protection for the community. There is fire equipment based at the Lotus Fire Department building, however this is a volunteer station which is only periodically staffed. The El Dorado County Fire District has multiple structure fire-fighting and ambulance stations that are each located approximately 10 minutes away in Cool, Garden Valley, Rescue and Placerville. The closest CALFIRE stations are at Greenwood and Pilot Hill – each approximately 10 minutes away by County road. The air support provided by CALFIRE’s Grass Valley airport location provides fast, critical help to fires extending beyond the main roads. Lack of staffed structural fire suppression equipment and the need for a full time staffed community fire station within the Coloma – Lotus Valley. Even though this issue is not addressed directly in this document it continues to be a major concern of local citizens. The bowl-shaped geography of the CL valley, because any fires starting on the valley floor quickly traveling uphill. Potential for wildfires in the CL valley cutting off available evacuation routes and routes of travel for inbound suppression equipment. Residents and visitors blocking evacuation routes and routes of travel for suppression equipment. Multiple one-lane roads as well as the Mount Murphy Road bridge are likely locations of congestion during an emergency. Numerous lodging and event venues are crowded, especially during the summer months, with visitors unfamiliar with area roads and emergency management programs. The CL area contains numerous commercial RV campgrounds, campgrounds managed by river rafting outfitters, B&Bs, other lodging and wineries that serve as event venues. The Marshall Gold Discovery State Historic Park historical structures, many built of wood, are difficult to protect. Variable daily wind directions, with up-canyon winds predominating during the day, and down-canyon winds during the evening. Strong winds and sometimes lightening brought by storm fronts from the north and west, particularly during the late summer through spring months. Increased tree mortality due to drought and bark beetle damage. increases in runoff during rainfall events tend to cause stream channel erosion. Since the organization of the CLFSC in 2015, the group has been proactive in alerting members of the CL community about ways to effectively prepare for wildfire, and thereby minimize the potential impacts. The Council has held evening meeting with speakers and discussion focused upon educating residents of the benefits of defensible space, the availability of fuel reduction resources (EDCFSC chipper program, etc.) and advantages of readiness prior to an emergency. The CLFSC continues to emphasize the importance of preparedness as exemplified by an October 2015 Community Preparedness Event, with presentations by the El Dorado County Office of Emergency Preparedness. The CLFSC was exceptionally pleased to receive funding for the Coloma-Lotus Phase 1 (CL-1) Project to complete over 36 acres of reduced fuel work along four major County roads. Approximately 7 miles of roadwork is planned for early 2017, to be completed through a coordinated effort by the EDCFSC, Greenwood California Conservation Crews (CCC) and EDC Department of Transportation. Project CL-1 is viewed as the first phase of a valley-wide effort to establish and maintain a Fire Safe Community. Once completed, the 36,960 (7.5 miles) of proposed fuel breaks will leverage the effectiveness of adjacent defensible space created by Coloma-Lotus residents and businesses, as well as fire safe actions by BLM, State Parks, County Parks and private landowners to strategically broaden the size of the Project shaded fuel breaks. The Marshall Road portion of the Project, located in a High Fire Hazard Severity Zone, will strategically reduce the potential for a wildland fire traveling uphill into the nearby Garden Valley community. The Lotus Road and Cold Springs Road corridor clearings will minimize the potential for a CLFSC area fire spreading south and west into the more populated Placerville area. Strengthen Community Education and Outreach: Strengthen community education and outreach related to fire safety, emergency preparedness and available vegetation management resources. Increase Fire Safe Road Access: Complete listed CLFSC projects that support landowner evacuation and fire fighter ingress through fuel reduction projects along roadways. Increase Defensible Space and Shaded Fuel Breaks: Encourage public and private landowners to leverage CLFSC road projects and other fire safe activities to create wider swaths of defensible space and shaded fuel breaks. Optimize Coordination with other Groups: Build the foundation to conduct mutually beneficially fire safe activities with area agencies, organizations, businesses and individuals. These CLFSC goals are intended to guide the Council’s activities, effectively using available resources. A periodic newsletter to be mailed out to area residents and businesses in the CLFSC area. This newsletter will have both general information about being a fire-wise / fire-safe community as well as information specific to the Coloma-Lotus area. Concerns, questions and issues about fire related topics can also be addressed. Development of internet based communications (e.g. Facebook) that are specific for the Coloma-Lotus community to keep residents informed of current and future planned projects; offer discussions of issues or concerns specific to the Coloma-Lotus area; and relay information about the past, current and future community meetings. Toward this end, the Council will coordinate and use the existing online resources of the EDCFSC, Grange and CL Chamber of Commerce. Discuss and inform residents of past, current and future fire safe activities and projects. Have guest speakers who can share their knowledge and experiences about fire related topics. Have fire related educational materials available to take home for those attending the meetings. Advise community members of various services that are available to help reduce the threat of or damage from fires in the community. Offer a social gathering where members of the community can get to know others in the community whereby they can build stronger communication links, friendships and support. Placement of Fire Danger Level signs at key locations along major area roads. Clear travel routes are vital to allow evacuation of residents and visitors, and inbound movement of suppression equipment and crews in the event of a wildfire in or near the Sphere of Recognition. Due to the area’s relatively few main roads, wind patterns and geography, some evacuation routes could be clogged or cut off. The roads and bridges are narrow, with many located on slopes that can easily be overrun by a wildfire, or clogged by evacuating vehicles and/or responding suppression equipment. It is critical that area roads can serve as transportation corridors and fuel breaks, where possible, to protect the community from the worst effects of wildfire. The CALFIRE Amador-El Dorado Fire Unit (AEU) Ignition Management Plan discusses how, in cooperation with El Dorado County and other local planning agencies, CALFIRE has oversight responsibility and reviews proposed land development permits for compliance with PRC 4290. In their review of land use permits, the number one factor CALFIRE considered is access. The AEU Plan states: “Access is a major fire prevention and protection need, whether wildland or structural. Failure to provide reasonable access for emergency equipment and evacuation exits for civilians can result in major loss of life, property and natural resources. Fire apparatus sitting at an intersection, waiting for civilians to exit on a narrow road, cannot provide the necessary fire suppression action. Safe access requires street and road networks that limit dead-end roads and provide reasonable widths, grades, turn-outs, and curves on all roads and driveways”. In accordance with CLFSC goals and CALFIRE priorities, the Council seeks to improve fire safe access routes, as shown in the Projects section, below. Clear routes are key to evacuating residents and allowing CALFIRE equipment to fight wildfires. The first project (CL-1) developed by the recently formed CLFSC involved shaded fuel breaks along four main transportation arteries to help insure safe evacuation of residents as well as safe ingress of firefighting equipment and crews. Additional shaded fuel breaks along other roads that lie within the CLFSC boundary are being planned. It is our goal that all the roadways within the CLFSC area have safe buffers (e.g. shaded fuel breaks and reduced fuel loads) to help insure the safety of our residents, visitors and emergency crews. Another CLFSC goal involves reducing hazardous fuel loads in other CL areas (in addition to the roadways) by creating shaded fuel breaks along the perimeters of the CLFSC boundary as well as around the perimeters of the public lands that lie within the CLFSC boundary. Working in coordination with willing land owners, the Council hopes that much of the CL area can be better treated and thereby reduce much of the fire danger and increase the safety of our residents, visitors and emergency responders. There are approximately 15 Bureau of Land Management (BLM) parcels within the CLFSC area for a total perimeter measurement of approximately 16.5 linear miles. 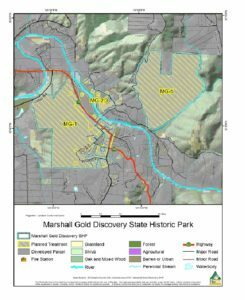 In addition to BLM, California State Parks has the Marshall Gold Discovery State Historic Park (MGDSHP) lands that lie in the heart of the CLFSC area. MGDSHP has two large main areas: the main historic region consisting of approximately 4.3 miles around its perimeter and the Mt. Murphy lands consisting of approximately 3.3 miles around its perimeter. The total perimeter around the MGDSHP lands is approximately 7.6 miles. As mentioned above, working with both willing land owners, the creation of shaded fuel breaks along these perimeters can be very beneficial in reducing fire danger. An 8 to 10-year maintenance cycle would be required and is envisioned as our best approach to maintain hazardous fuel levels to a minimum. This 8 to 10-year cycle would be acceptable for reducing brush and tree overgrowth. Regrowth will be the greatest in and near the drainages. Observed regrowth in the described previous projects suggests the regrowth in this project will be slow. Custodial fuel reduction maintenance to the project site is not expected to be required before 8 or more years. When maintenance might be necessary to ‘tune-up’ the fuel reduction, that maintenance will likely include the removal of understory vegetation, but to a lesser degree than the vegetation exists today. The CLFSC recognizes and appreciates the ongoing fire safe efforts by Coloma – Lotus community agencies, organizations and individual, as well as the ongoing support of CLFSC activities by the Gold Trail Grange and CL Chamber of Commerce, described below. We look forward to continued coordination and, when appropriate, co-sponsoring educational and fuel reduction activities and projects with the groups listed below. The American River Conservancy (ARC) has conducted extensive past and ongoing fire safety projects involving fuel reduction in the CLFSC area on ARC-owned property. ARC lands within the CLFSC area includes portions of the Wakamatsu Colony Farm site located along Cold Springs Road and surrounding the Gold Trail School. The 272-acre Wakamatsu site has an active Vegetation Management Plan developed with CALFIRE. The ARC site is located adjacent to private lands, including rural residential lands and agricultural lands. There is also a public middle school located adjacent to the site (Gold Trail School). In addition, Wakumatsu Colony Farm is located in a Moderate Fire Hazard Severity Zone. The area has vegetation and topographic features that affect fire intensity and rate of spread (according to CALFIRE) and the project site is identified in the Amador-El Dorado – Sacramento CALFIRE Unit’s Strategic Fire Plan. Work performed since 2011 includes fuel reduction/understory brush clearing, prescribed fire and ongoing grazing to reduce fuel loads. Fuel reduction/understory brush clearing: The “Fuel Reduction in the South Fork American River Watershed” project involved manual fuel reduction activities performed by California Conservation Corps (CCC) crew members on approximately 35 acres of densely forested oak woodland within the South Fork American River Watershed. In 2013, CCC crews worked for approximately 1,500 hours to treat 6 acres of area. In 2015, CCC crews worked for 1920 hours (collectively) to treat 10 acres of area. Prescribed Fire: In 2011 ARC worked with CALFIRE to create a Vegetation Management Plan that allowed for the use of prescribed fire at the Wakamatsu Farm. In 2012 and 2013, prescribed burns were carried out as live fire training exercises utilizing local CALFIRE and County Fire crews. Approximately 60 acres total of annual grassland/oak savannah were treated between 2012 and 2013. Grazing to reduce fuel loads: ARC currently leases approximately 80 acres of irrigated pasture and dry land pasture to Free Hand Farm, a local family-owned business to graze sheep and cattle at the Wakamatsu Farm. The addition of livestock to the management of the property has resulted in reduced levels of yellow star thistle and medusahead grass, effectively helping to reduce fuel loads in the grassland areas. The overall purpose of ARC fire safe efforts is to reduce, modify, and manage fuels within the Wakumatsu Farm that may enhance mitigation efforts in the event of a wildland fire situation. The primary objective is to reduce accumulations of flammable low brush species such as Scotch Broom (Cytisus scoparius), Manzanita (Arctostaphylos manzanita ), coyote brush (Baccharis pilularis), ceanothus (Ceanothus cuneatus) and Toyon (Heteromeles arbutifolia) and reduce ladder fuels from existing interior live oak trees. The dominant overstory consists of interior live oak (Quercus wislizeni) with a few blue oak and grey pines. All the brush and vegetation that removed by CCC crews manually (using hand tools and chainsaws) was chipped onsite. The Bureau of Land Management (BLM) Mother Lode Field Office owns and manages approximately 17 parcels of land totaling about 1000 acres along and near the South Fork of the American River. Only non-motorized recreational activities such as hiking, mountain biking, horseback riding and other similar passive activities are allowed upon these BLM sites. 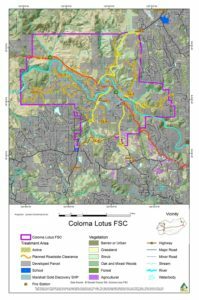 Of these parcels, the most popular include three day-use and river access sites within the Coloma – Lotus FSC area, described below. · Dave Moore Nature Area: One of the main features of the Dave Moore Nature Area is a loop trail about a mile long which goes from the parking lot trail head to the South Fork American River and back again passing through several habitat types and providing access for pedestrians, wheelchairs and baby strollers. Greenwood Creek developed by BLM in 2005 primarily to serve kayakers and rafters, also connects via trails to Magnolia and Cronan Ranch trails. This area has 40 car-sized parking stalls; trailers and recreational campers are not allowed. Kayaks and rafts must be carried to the parking lot via a trail from the river that is approximately 1/3 mile in length. Magnolia Ranch – with its large parking lot capable of handling horse trailers and extensive trail network connected to the larger Cronan Ranch, Magnolia Ranch serves numerous area equestrians and other trail users. It is the only BLM parking area visible from Highway 49, and therefore attracts visitors who may not be familiar with other public recreational facilities. BLM’s South Fork American River Management Plan, adopted in 2004, guides development and use of their lands. Individual parcel descriptions and management plans are provided. Overall operation and maintenance of BLM’s recreational properties includes fire prevention related activities including vegetation control and fuels management using prescribed burns, control of noxious weeds and grazing. BLM lands also provide emergency vehicle access to otherwise inaccessible portions of the South Fork of the American River. Dave Moore Nature Area, Greenwood Creek and the Magnolia Ranch area all receive annual and weekly maintenance during the year. Limbing of trees close to trails occurs every 3-5 years. All areas are weed-eaten where vehicles park and around site facilities. If there is a need to clear trail from felled trees or trees that are dying or in need of trimming, maintenance is done on an as needed basis. Adjoining Cronan Ranch, connected by trails to Magnolia and Greenwood, has its own BLM management plan. Removal of invasive weeds has been a priority in managing Cronan Ranch. All trails systems (18 miles of trails) have been mowed and sprayed for invasive weeds on an annual basis. Starting in May of 2015 and continuing through 2016, BLM has been grazing the Cronan Ranch by sheep. Over 400 sheep are grazing at any given time for 4-5 months during the spring and late summer months to help stop the spread of invasive weeds and reduce the grass fuels from building up. Over 500 acres are being grazed annually on this property. Prescribed burn has been proposed in this area but conditions to burn are very stringent and windows of time to make this a reality are narrow. BLM would use test plots first to determine whether this will be an effective tool to use. Marshall Gold Discovery State Historic Park (MGDSHP), created in 1942 and now grown to over 576 acres in size, encompasses most of the historic town of Coloma, the Monroe Ridge to the south of the town site and Mount Murphy on the north side of the river. With about 450 year-round residents in the surrounding area, the tree-lined streets of the historic park are usually quiet, shady, and serene. Most of the park’s approximately 250,000 annual visitors (many of them elementary school students) come year-round, including the annual celebration of Marshall’s January 24, 1848 gold discovery, monthly living history events and special events. The Park has a number of historic structures – many dating back to the gold rush era, include the working blacksmith shop; the Price-Thomas, Miller, Thomas, Weller, Monroe, Williams, and Papini homes; the Coloma Greys; the James Marshall cabin; the old Schoolhouse; the Argonaut; the Oddfellows Hall; and the Emanuel and St. John’s Churches. All of these structures are irreplaceable historic wooden buildings. In addition to these structures, there are also other historic structures made primarily of stone and brick with wooden interiors and/or roofing components and two historic cemeteries. Other MGSDSP structures for maintenance, housing and public use facilities are located throughout the park. Aware of their vulnerability to fire, and need for large-scale vegetation management, there has been some ongoing fuel reduction and forest health work on Monroe Ridge and other maintenance activities in developed areas throughout the Park. The Park’s vegetation management work has included landscape level cutting, piling and burning of excessive fuels on the ridge, including dead and dying trees and shrubs and downed woody debris, as well as removal of invasive plants that contribute to fuel loading (broom, olive, locust and tree of heaven). Dead, dying and other hazardous trees are removed from facility areas on a routine basis around the town of Coloma. Mowing and weed removal from fields and roadside areas occurs on an annual basis. Fuel reduction on Mt. Murphy (at highest probably ignition points/interior live oak woodlands). The Coloma – Lotus Chamber of Commerce (CL CofC), started in 1998 and now with over 100 members, generously donated the initial funding of $200 that allowed the CLFSC to formally organize. The funds were used to set up and maintain a bank account with Umpqua Bank and a post office box at the Coloma post office. The CL CofC, through its website (www.coloma.com), annual CL Guide and ongoing communications with its members, provides an important communication channel for CLFSC activities. The Gold Trail Grange, located along Highway 49 within the SHP, serves as a vibrant community center in the Coloma-Lotus Valley. The Grange partners with various local community groups and non-profits such as the American River Conservancy, Coloma-Lotus Chamber of Commerce, CL FSC, local farmers, artisans and artists, and civic leaders to bring important and interesting events and activities to the community. Since the start of forming a local FSC, the Gold Trail Grange No. 452 has graciously allowed all CLFSC meetings to occur in the grange building at no cost to the Council. The Grange also donated $200 that has been used to maintain a bank account with Umpqua Bank and a post office box at the Coloma post office. The Grange, through its Facebook page (www.facebook.com/goldtrailgrange/), standing committee for preparedness and resiliency, and ongoing communications with its members, provides an important communication channel for CLFSC activities. The six CLFSC and five Marshall Gold Discovery (MG) fuel reduction projects described on the following pages, were developed in anticipation of future grant opportunities. The Council plans to submit fuel reduction project applications tailored to funding sources, such as CALFIRE grants, as funding opportunities arise. We also intend to pursue additional fire safe projects like the ones described in Section 4.3, Increase Defensible Space and Shaded Fuel Breaks, and in Section 4.4, Coordinate Fire Safe Activities with other CLFSC Area Agencies and Organizations. Implementing fire safe projects, especially those included below, will allow the Council to pursue and meet its goals. Pending CLFSC fuel reduction projects in this Countywide CWPP were developed and prioritized based upon fire severity maps, road conditions and number of residences served. The listed projects consist of shaded fuel breaks along existing roads that primarily are used to access residences, with some business and visitor use. Projects CL-2 through CL-7, are generally in priority order. Project CL-2 has all its roads in Red category of fire severity. Distance of minor road to a main road, as well as the number of parcels and developed parcels were also considered. 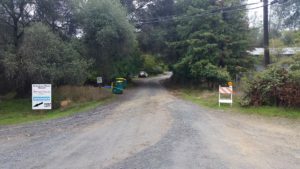 Several short roads within the CLFSC area were not listed in the Projects section, however could be listed and funded in grant applications if they meet funding priorities. In the Projects listed and mapped following, there is fuel reduction work that may be done on public road rights of way (ROWs) and fuel reduction that might be done on private property. In all cases, the CLFSC would need to apply for funding through CALFIRE or other funding agency, and be awarded the funds. In the event the CL Fire Safe Council received funds for fire safe work, fuel reduction work on public ROWs would require an El Dorado County Department of Transportation (as the owner of County Roads), or a permit from Caltrans (owner of State Highway 49). If funding for fuel reduction work on private property became available, the access to private land would be fully optional. A signed access agreement from the property owner (not renter or other resident) for specified fuel reduction work, for a specified time-period would be required. In short, without a signed agreement there would be no access or work on private property. As the funding for CALFIRE and other grant-related fire safe work is very limited, any property owner who does not want work upon their land would free up funds for properties owned by willing participants. The proposed CLFSC CWPP Projects are presented in the Projects attachment to this CWPP. Roadside clearing widths and acreage amounts were calculated excluding the road pavement. For example, a 30-foot wide road clearing would involve 15 feet of clearing on both sides of the pavement. Project Description: What are the goals of the project? Try to state the goals in a simple concise sentence. The goals should relate to the reduction of wildland fire risk to dwellings and/or improvement in fire safety to community assets. Example: This project will improve the Tabletop Road for use as a primary escape route for the Sunset community. Describe the objectives of the project. Example: if the goal is to educate property owners on techniques for reducing the ignition risk to their dwellings, then an objective may be to hold some number of 4 hour workshops. This Fuel Reduction Project will create 38.6-acres of shaded fuel break along residential roads in the Coloma-Lotus Fire Safe Council (CL FSC) area of El Dorado County. An estimated 112 habitable structures, with the potential to increase to 166 homes, depend upon these roads. The Project will clear up to 6.2 linear miles of access corridors, to provide an enlarged fuel reduction zone for firefighting operations as well as promote safe evacuation of the residents. See attached Project area maps and CL-2 Table 1, below. New River Road 0.1 528 50 0.6 5917 New River Road at Coloma Hts. Road 6019 New River Road 0.1 mi. Carvers Road 0.7 3696 50 4.2 6730 Carvers Road at Mt. Murphy Road 6620 Carvers Road 0.7 mi. Emergency Access Carver Road – Scott Road Connector 0.3 1584 30 1.1 River Mountain Property End of Scott Road 0.3 mi. Bayne Road [2nd part] 1.8 9504 50 10.9 6126 Bayne Road starting at River Road intersection 7089 Bayne Road 1.8 mi. Mt. Murphy Road 3.3 17,424 50 20.0 6700 Mt. Murphy Road at Hwy. 49 5502 Mt. Murphy Road 3.3 mi. For the proposed Project, tree limbs, shrubs and other brush up to 16 feet above the roadway will be removed. Overall clearing of up to 25 feet in width along each side of the roads will also be conducted. We recognize that the treated areas will require maintenance to sustain the effectiveness of the road fuel breaks. The Project is devised explicitly to be combined with residents’ defensible space adjacent to each Project area. This Project is part of a valley-wide effort to establish and maintain a Fire Safe Community (see CL-2 Table 2). Once complete, the 6.5 miles of proposed fuel breaks located in high (red) severity fire areas will leverage the effectiveness of adjacent defensible space created by Coloma-Lotus residents and businesses, as well as fire safe actions by BLM, State Parks, County Parks and private landowners to strategically broaden the size of the Project shaded fuel breaks. Project Maintenance Requirements: Describe what maintenance will be required and on what schedule. Once a fuel reduction project is completed, it is anticipated that the treated roadways would not need to be cleared again for 8 to 10 years. This is within the 5 to 10-year timeframe of the CWPP. Other Considerations: Describe any other consideration that must be taken into account to successfully complete this project such as; permits, clearances, approvals, etc. For the proposed project, additional considerations include scheduling and budgeting, requirements related to California Environmental Quality Act (CEQA) documentation and environmental permits; right of entry forms for all public and private properties; and safety. Appropriate documentation to meet CEQA, or NEPA for federal lands, will be completed as each project is planned and scheduled. This will allow an appropriate level of site-specific analysis that will occur within each project’s appropriate time frame. Biological and cultural resource studies will be conducted as needed. Environmental permits will be obtained if needed, to be determined during the CEQA-level assessment of resources. Right of entry forms to allow workers access all public and private properties would be obtained. Schedule considerations recognize that fire safe projects are best scheduled after fire season, when personnel are most available, and before bird nesting season. This leaves a relatively narrow November through mid-February timeframe. Budget considerations determine the amount and level of work that would be completed. Safety considerations, including the need for traffic control during road clearing work are also budget and schedule considerations. Coloma Heights Rd provides passage to business & homes. Photograph: Coloma Heights Road provides access to businesses and homes, October 2016. This Fuel Reduction Project will create 31.8-acres of shaded fuel break along residential roads in the Coloma-Lotus Fire Safe Council (CL FSC) area of El Dorado County. An estimated 77 habitable structures, with the potential to increase to 114 homes, depend upon these roads. The Project will clear up to 6.0 linear miles of access corridors, to provide an enlarged fuel reduction zone for firefighting operations as well as promote safe evacuation of the residents. See attached Project area maps and CL-3 Table 1, below. Scott Road 0.6 3,168 50 3.6 1090 Scott Road at Marshall Road 1292 Scott Road at Far End 0.6 mi. River Road 0.3 1,584 50 1.8 500 River Road at Bayne Road 620 River Road at Far End 0.3 mi. Serenity Lane 0.4 1,584 30 1.1 Serenity Lane at Bayne Road 1199 Serenity Lane at Far End 0.4 mi. Toad Road 0.1 528 30 0.4 559 Toad Road at Bayne Road 598 Toad Road at Far End 0.1 mi. Twin Ridges Road 0.1 528 30 0.4 4000 Twin Ridges Road at Bayne Road 4004 Twin Ridges Road at Far End 0.1 mi. Sea Ranch Road 0.1 528 30 0.4 Sea Ranch Road at Twin Ridges Road Sea Ranch Road at Far End 0.1 mi. Bayne Court 0.3 1,584 30 1.1 Bayne Ct. at Bayne Road Bayne Ct. at Far End 0.3 mi. Mule Ear Road 0.1 528 30 0.4 Mule Ear Road at Bayne Road Mule Ear Road at Far End 0.1 mi. Johnson Ranch Road 0.2 1,056 30 0.7 Johnson Ranch Road at Hwy 49 Johnson Ranch Road at Far End 0.2 mi. Westar Court 0.3 1,584 30 1.1 5831 Westar Ct. at Hwy 49 5802 Westar Ct. at Far End 0.3 mi. Serpentine Road 0.1 528 30 0.4 Serpentine Road at Hwy 49 Serpentine Road at Far End 0.1 mi. El Campo Road 0.3 1,584 30 1.1 1001 El Campo Road at Bassi Road 1160 El Campo Road at Far End 0.3 mi. Lullaby Lane 0.1 528 30 0.4 1988 Lullaby Lane at Bassi Road Lullaby Lane at Far End 0.1 mi. For the proposed Project, tree limbs, shrubs and other brush up to 16 feet above the roadway will be removed. Overall clearing of up to 25 feet in width along both sides of the roads will also be conducted. We recognize that the treated areas will require maintenance to sustain the effectiveness of the road fuel breaks. The Project is devised explicitly to be combined with residents’ defensible space adjacent to each Project area. This Project is part of a valley-wide effort to establish and maintain a Fire Safe Community (see CL 3 Table 2, below). Once complete, the 6.0 miles of proposed fuel breaks located in moderate (orange) to high (red) severity areas will leverage the effectiveness of adjacent defensible space created by Coloma-Lotus residents and businesses, as well as fire safe actions by BLM, State Parks, and the American River Conservancy to strategically broaden the size of the Project shaded fuel breaks. Once a fuel reduction project is completed, it is anticipated that the roadways would not need to be cleared again for 8 to 10 years. This is within the 5 to 10-year timeframe of the CWPP. 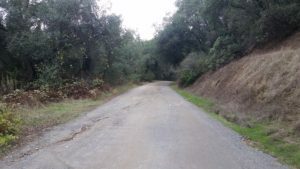 This Fuel Reduction Project will create 41.2-acres of shaded fuel break along residential roads in the Coloma-Lotus Fire Safe Council (CL FSC) area of El Dorado County. An estimated 81 habitable structures, with the potential to increase to 140 homes, depend upon these roads. The Project will clear up to 7.4 linear miles of access corridors, to provide an enlarged fuel reduction zone for firefighting operations as well as promote safe evacuation of the residents. See attached Project area maps and CL-4 Table 1, below. Little Road 0.2 1,056 30 1.0 5001 Little Road at Hwy 49 4948 Little Road to Far End 0.2 mi. Beach Court 0.2 1,056 30 1.0 852 Beach Court at Hwy 49 870 Beach Ct. to Church 0.2 mi. Amoloc Lane 0.7 3,696 50 3.4 7126 Amoloc Lane at Hwy 49 7330 Amoloc Ln. to Far End 0.7 mi. Prospectors Road 2.0 10,560 50 9.7 6721 Prospectors Road at Marshall Road (Lower End) 5980 Prospectors Road (Upper End) 2.0 mi. Thompson Hill Road 2.2 11,616 50 10.7 5761 Thompson Hill Road at Cold Springs Road 4801 Thompson Hill Road 2.2 mi. For the proposed Project, tree limbs, shrubs and other brush up to 16 feet above the roadway will be removed. Overall clearing of 25 feet in width along both sides of the roads will also be conducted. We recognize that the treated areas will require maintenance to sustain the effectiveness of the road fuel breaks. The Project is devised explicitly to be combined with residents’ defensible space adjacent to each Project area. This Project is part of a valley-wide effort to establish and maintain a Fire Safe Community (see CL 4 Table 2, below). Once complete, the 7.4 miles of proposed fuel breaks located in high (red) to moderate (orange/yellow) severity areas will leverage the effectiveness of adjacent defensible space created by Coloma-Lotus residents and businesses, as well as fire safe actions by BLM, State Parks, and the American River Conservancy to strategically broaden the size of the Project shaded fuel breaks. Photograph: Entrance to Little Road, accessed from State Highway 49, October 2016. 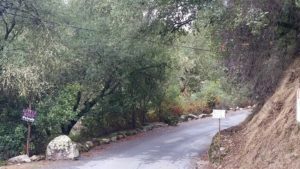 This Fuel Reduction Project will create 34.0-acres of shaded fuel break along residential roads in the Coloma-Lotus Fire Safe Council (CL FSC) area of El Dorado County. An estimated 81 habitable structures, with the potential to increase to 106 homes, depend upon these roads. The Project will clear up to 7.0 linear miles of access corridors, to provide an enlarged fuel reduction zone for firefighting operations as well as promote safe evacuation of the residents. See attached Project area maps and CL-5 Table 1, below. Clark Mountain Road 2.4 12,672 50 11.6 5601 Clark Mountain Road at Petersen Lane 6570 Clark Mt. Road (stop here) 2.4 mi. Hallelujah Trail 1.8 9,504 50 8.7 1216 Hallelujah Trail at Clark Mt. Road Go 1.8 mi. God’s Way 0.6 3,168 50 2.9 6727 God’s Way at Clark Mt. Road 7000 God’s Way to Far End 0.6 mi. Smokey Way 0.2 1,056 30 1.0 Smokey Way off No Easy Road Go to 5000 Smokey Way loop 0.2 mi. No Easy Road 0.3 1,584 30 1.5 5000 No Easy Road off Clark Mt. Road No Easy Road to Far End 0.3 mi. Marbro Road 0.5 2,640 50 2.4 2339 Marbro Road off Clark Mt. Road Go to Far End of Marbro Road 0.5 mi. Pozo Lane 0.2 1,056 30 1.0 2211 Pozo Lane off Clark Mtn. Road Go to Far End of Pozo Lane 0.2 mi. Granite Creek Road 0.3 1,584 30 1.5 5181 Granite Creek Road off Lotus Road 5398 Granite Creek Road 0.3 mi. This Project is part of a valley-wide effort to establish and maintain a Fire Safe Community (see CL 5 Table 2, below). Once complete, the 7.0 miles of proposed fuel breaks located in low (yellow) severity areas will leverage the effectiveness of adjacent defensible space created by Coloma-Lotus residents and businesses, as well as fire safe actions by BLM, State Parks, and the American River Conservancy to strategically broaden the size of the Project shaded fuel breaks. Once a fuel reduction project is completed, it is anticipated that the roadways would not need to be cleared again for 8 to 10 years. This is within the 5 to 10-year timeframe of the CWPP. Other Considerations: Describe any other consideration that must be taken into account to successfully complete this project such as; permits, clearances, approvals, etc. Photograph: Granite Creek Road, accessed from Lotus Road, October 2016. 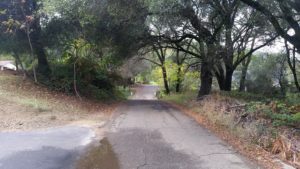 This Fuel Reduction Project will create 21.1-acres of shaded fuel break along residential roads in the Coloma-Lotus Fire Safe Council (CL FSC) area of El Dorado County. An estimated 112 habitable structures, with the potential to increase to 166 homes, depend upon these roads. The Project will clear up to 5.0 linear miles of access corridors, to provide an enlarged fuel reduction zone for firefighting operations as well as promote safe evacuation of the residents. See attached Project area maps and CL-6 Table 1, below. Lodestar Lane 0.6 3,168 50 2.9 5631 Lodestar Lane at Hwy 49 5469 Lodestar Ln. at Amoloc Ln 0.6mi. Deloro Lane 0.4 2,112 30 1.9 5520 Deloro Lane at Hwy 49 5480 Deloro Lane at Far End 0.4 mi. Winding Creek Lane (aka No Name Road) 0.1 528 30 0.5 Winding Creek Lane (aka No Name Road) at Mt. Murphy Winding Creek Lane, go 0.1 mi. or 528 ft. then stop. Mountain View Drive 0.9 4,752 50 4.4 5120 Mountain View Drive at Lotus Road 4747 Mountain View Drive 0.9 mi. Heaven’s Gate 0.7 3,696 30 3.4 5620 Heaven’s Gate at Lotus Road 4891 Heaven’s Court 0.7 mi. Church St. 0.1 400 30 0.4 Church St. at Hwy 49 Go to the driveway at 379 Church St. then stop. Tara View Loop 0.7 3,696 30 2.5 5303 Tara View Loop at Mt. Murphy Road 5394 Tara View Loop 0.7 mi. Sagebrush Road 0.8 4,224 30 2.9 6099 Sagebrush Road at Mt. Murphy Road 4860 Sagebrush Road 0.8 mi. Out Back Lane 0.2 1,056 30 0.7 6300 Out Back Lane at Mt. Murphy Road 6399 Out Back Lane 0.2 mi. Mean Mule Way 0.2 1,056 30 0.7 Mean Mule Way off No Name Road 6200 Mean Mule Way 0.2 mi. This Project is part of a valley-wide effort to establish and maintain a Fire Safe Community (see CL 6 Table 2, below). Once complete, the 5.0 miles of proposed fuel breaks located in low (yellow) to moderate (orange) severity areas will leverage the effectiveness of adjacent defensible space created by Coloma-Lotus residents and businesses, as well as fire safe actions by BLM, State Parks, and others to strategically broaden the size of the Project shaded fuel breaks. Photograph: Church Street, accessed from State Highway 49, October 2016. This Fuel Reduction Project will create 46.6-acres of shaded fuel break through the center of the Coloma-Lotus Fire Safe Council (CL FSC) area of El Dorado County. An estimated 38 habitable structures, with the potential to increase to 44 homes, depend upon these roads. The Project will clear up to 6.4 linear miles of access corridors, to provide an enlarged fuel reduction zone for firefighting operations as well as promote safe evacuation of the residents. See attached Project area maps and CL-7 Table 1, below. For the proposed Project, tree limbs, shrubs and other brush up to 16 feet above the roadway will be removed. Overall clearing up to 30 feet in width along both sides of the roads will also be conducted. We recognize that the treated areas will require maintenance to sustain the effectiveness of the road fuel breaks. The Project is devised explicitly to be combined with residents’ defensible space adjacent to each Project area. This Project is part of a valley-wide effort to establish and maintain a Fire Safe Community (see CL 7 Table 2, below). Once complete, the approximately 6.4 miles of proposed fuel breaks located in low (yellow) to moderate (yellow) and high (red) severity areas will leverage the effectiveness of adjacent defensible space created by Coloma-Lotus residents and businesses, as well as fire safe actions by BLM, State Parks, and businesses along Highway 49 to strategically broaden the size of the Project shaded fuel breaks. Is located in the middle of the Coloma Lotus FSC sphere of influence and was the first official California State Park. In 1848 gold was first discovered on this land in California. The Park brings numerous visitors to the Coloma area all year long. The Park also contains numerous historic structures that could be lost in the event of a wildfire. The Park management takes its fuels reduction seriously and has tried to keep up with vegetation regrowth around the structures. They have been a participant with the FSC in determining areas that need to be treated to reduce the impact of a wildfire entering or leaving the Park. The following is a list of proposed areas for treatment. Est. Cost per Acre (I): $2,000 per acre for fuel treatment projects; $90,000 lump sum for Planning Study. For the future, the Park staff intends its existing fire safe activities to continue, as well as expand, to include the five fire safe efforts described below. Project Description: The MG-1 Project would remove excess fuels from Monroe Ridge within Marshall Gold Discovery State Historic Park. This includes the manual removal of heavily damaged, dead and downed fuels and non-historic invasive tree and shrub species. Undesirable vegetation will be piled and burned on site. The goal of the project would be to reduce the fuels to a level that the woodlands could survive all but the most catastrophic of fires and improve forest health. Project Description: The MG-2 Project would identify and evaluate all of the structures within the park boundary as well as any habitable structures within 100-foot of the park boundary for defensible space needs and assign a priority rating. Project Description: This project would implement defensible space work around any of the structures identified in project MG-2, beginning with those of highest priority. Department standards would be followed to obtain defensible space objectives. Project Description: The MG-4 Project would involve the writing of a wildfire management plan that could be referenced and provide guidance in the event of a wildfire in or adjacent to the park. It would include the mapping of roads, water sources, sensitive resources and other information pertinent to wildfire suppression. MG-5: Fuel reduction on Mt. Murphy would be focused upon the highest probable ignition points generally located within interior live oak woodland habitat areas. This project has not been initiated as of 2016. Once a planning report, such as a Park-wide fire safe plan, is prepared, it would be reviewed for minor updates every 5 years. Major planning updates would occur every 10 to 20 years. Once a fuel reduction project is completed, it is anticipated that the treated roadways would not need to be cleared again for 8 to 10 years. This is within the 5 to 10-year timeframe of the CWPP. For the proposed project, other considerations include scheduling and budgeting, requirements related to California Environmental Quality Act (CEQA) documentation and environmental permits; right of entry forms for all public and private properties; and safety. Appropriate documentation to meet CEQA will be completed as each project is planned and scheduled. This will allow an appropriate level of site-specific analysis that will occur within each project’s appropriate time frame. Biological and cultural resource studies will be conducted as needed. Safety considerations, including the need for traffic control for visitors during fuel clearing work are also budget and schedule considerations.